... but the show maintained and built its tense atmosphere as the danger of exposure and violence grew. Pretty Little Liars Season 5 Episode 7 continues withholding the mysteries surrounding A, Bethany and even Alison. The slow progress is something viewers have come to accept from the series, and this season, more than past ones, keeps our interest by providing dramatic character development. And we also got some really great Pretty Little Liars quotes. Pretty Little Liars Photos from "The Silence of E. Lamb"
The only real clues this week came from Aria's volunteer work at Radley. After surreptitiously placing Bethany's picture in with a bunch of random photos meant to inspire the patients at Radley, Aria is quickly confronted by Rhonda, Bethany's former roommate. It's a scary moment for Aria, but not as terrifying as when she's nearly caught snooping in Rhonda's room. Luckily, she finds Bethany's sketchbook, which reveals much more than the young patient's hatred for Mrs. DiLaurentis (though there's a choice sketch of Alison's mom with devil's horns). It looks like Bethany was present when Toby's mom fell or jumped out of that window. Does she hate Mrs. Di for covering up what happened to Mrs. Cavanaugh? Is that why she ended up in Alison's grave? And just what happened to Eddie Lamb? 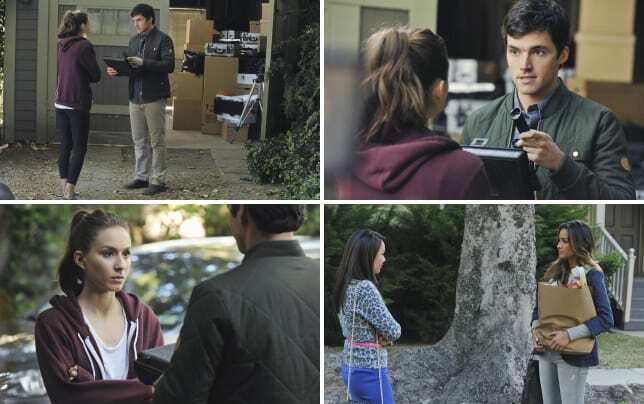 Aria's spying raised Eddie's suspicious and then he failed to meet up with Ezra. Do you think he's upset by Aria's presence at Radley or will he pop up in a backyard grave next? This episode worked a little more for me when it came to the characters' more dramatic moments. For her part, Emily continued trying to figure out how she really feels about Alison. Alison has been especially needy, which has struck as odd about a character who's usually so independent. I figure she's just being manipulative as always. Luckily, Emily's mom helpfully mentions that Emily doesn't have to keep on saving Alison. Suddenly, Emily calls Paige to check on her after that whole dead rat incident. Is this a sign that she's ready to move on from her feelings for Alison? Unfortunately, Hanna continues her downward spiral and growing dependency with alcohol - and, I'm sorry to say, part of it might be Caleb's fault. Her former (and possibly current) boyfriend has been drinking an awful lot, blowing off school and his future and just generally being a very moody rebel. It's starting to have an effect on Hanna's behavior. Clearly, Hanna's change is a result of Alison's return, her own self-esteem issues and Caleb's attitude. Maybe for once Alison is right and Hanna should just cool things off with Caleb until things are more settled for her. The whole thing definitely makes Hanna a more compelling and sympathetic character, which is better than being the clueless ditz. But I will admit that I enjoy how sassy Hanna's gotten lately, especially after a few sips of vodka. Unfortunately, she also gets a little too loose-lipped and totally spilled the secret about New York to Sydney. And now A knows all Hanna's little slip up. So, is Sydney working for A? Spencer didn't have much to do this week, but I was very interested in the way Melissa responded to their talk about their parents. Melissa says it's all a matter of love while Spencer brings up all the lies that have led to two dead bodies being buried in the backyards of Rosewood homes. Yet, Melissa maintains, it's comes down to an issue of love. Who's love is she talking about? Regardless, Spencer is still suspicious of both her father and sister and uses Ezra's spy camera to find out what she might be up to. This time she didn't catch Melissa, but she did see Alison in her backyard heading towards the barn in much more inconspicuous clothing. It looks like the big question this season will be: What is Alison hiding? She killed Bethany Young. She's A. Nothing; she's just trying to apologize to Melissa. She and Melissa are working together to catch A.